Spring - @Transactional - What happens in background? I want to know what actually happens when you annotate a method with @Transactional? Of course, I know that Spring will wrap that method in a Transaction. Note: Since this mechanism is based on proxies, only 'external' method calls coming in through the proxy will be intercepted. This means that 'self-invocation', i.e. a method within the target object calling some other method of the target object, won't lead to an actual transaction at runtime even if the invoked method is marked with @Transactional! Why only external method calls will be under Transaction and not the self-invocation methods? This is a big topic. The Spring reference doc devotes multiple chapters to it. I recommend reading the ones on Aspect-Oriented Programming and Transactions, as Spring's declarative transaction support uses AOP at its foundation. But at a very high level, Spring creates proxies for classes that declare @Transactional on the class itself or on members. The proxy is mostly invisible at runtime. It provides a way for Spring to inject behaviors before, after, or around method calls into the object being proxied. Transaction management is just one example of the behaviors that can be hooked in. Security checks are another. And you can provide your own, too, for things like logging. So when you annotate a method with @Transactional, Spring dynamically creates a proxy that implements the same interface(s) as the class you're annotating. And when clients make calls into your object, the calls are intercepted and the behaviors injected via the proxy mechanism. Transactions in EJB work similarly, by the way. As you observed, through, the proxy mechanism only works when calls come in from some external object. When you make an internal call within the object, you're really making a call through the "this" reference, which bypasses the proxy. There are ways of working around that problem, however. I explain one approach in this forum post in which I use a BeanFactoryPostProcessor to inject an instance of the proxy into "self-referencing" classes at runtime. I save this reference to a member variable called "me". Then if I need to make internal calls that require a change in the transaction status of the thread, I direct the call through the proxy (e.g. "me.someMethod()".) The forum post explains in more detail. Note that the BeanFactoryPostProcessor code would be a little different now, as it was written back in the Spring 1.x timeframe. But hopefully it gives you an idea. I have an updated version that I could probably make available. When Spring loads your bean definitions, and has been configured to look for @Transactional annotations, it will create these proxy objects around your actual bean. These proxy objects are instances of classes that are auto-generated at runtime. The default behaviour of these proxy objects when a method is invoked is just to invoke the same method on the "target" bean (i.e. your bean). However, the proxies can also be supplied with interceptors, and when present these interceptors will be invoked by the proxy before it invokes your target bean's method. For target beans annotated with @Transactional, Spring will create a TransactionInterceptor, and pass it to the generated proxy object. So when you call the method from client code, you're calling the method on the proxy object, which first invokes the TransactionInterceptor (which begins a transaction), which in turn invokes the method on your target bean. When the invocation finishes, the TransactionInterceptor commits/rolls back the transaction. It's transparent to the client code. As for the "external method" thing, if your bean invokes one of its own methods, then it will not be doing so via the proxy. Remember, Spring wraps your bean in the proxy, your bean has no knowledge of it. Only calls from "outside" your bean go through the proxy. 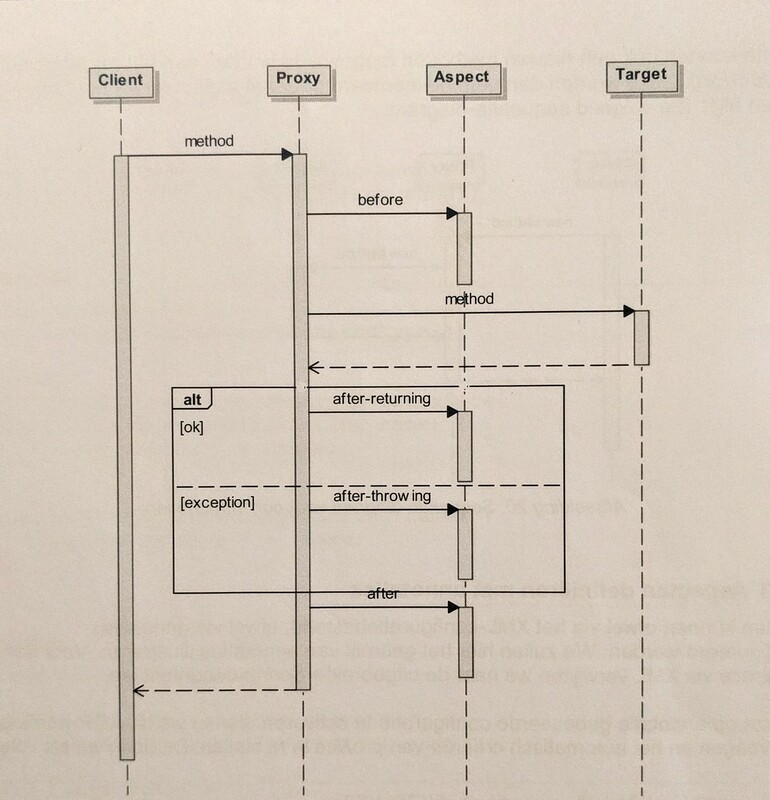 As a visual person, I like to weigh in with a sequence diagram of the proxy pattern. If you don't know how to read the arrows, I read the first one like this: Client executes Proxy.method(). The simplest answer is, on whichever method you declare @Transactional the boundary of transaction starts and boundary ends when method completes. If you are using JPA call then all commits are with in this transaction boundary. Lets say you are saving entity1, entity2 and entity3. Now while saving entity3 an exception occur then as enitiy1 and entity2 comes in same transaction so entity1 and entity2 will be rollback with entity3. Transaction : (entity1.save, entity2.save, entity3.save). Any exception will result in rollback of all JPA transactions with DB. Internally JPA transaction are used by Spring. Not the answer you're looking for? Browse other questions tagged java spring spring-aop spring-jdbc transactional or ask your own question. How does Spring @Transactional Really Work? How to handle internal calls on Spring/EJB/Mockito… proxies? @Transactional annotation works with saveAndFlush? Transactional annotation in spring - how does it work? Do I want to minimize the scope of @Transactional? Spring - @Transactional with ScheduledExecutorService - What happens in background? How to execute custom sql code in every transaction managed by spring DataSourceTransactionManager?